Analog Way's VIO 4K multi-format converters will be used as part of the ground video processing for cameras mounted on the first, or core, stage of NASA’s Space Launch System (SLS) rocket. The most powerful rocket ever built by NASA, SLS is the vehicle that will be used to launch missions beyond Low Earth Orbit (LEO). 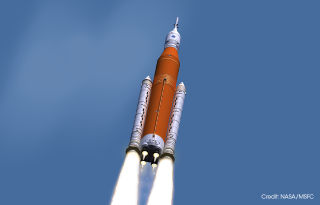 More powerful than the Saturn V moon rocket, SLS will enable astronauts to begin their journey to explore destinations far into the solar system. SLS has eight cameras on the exterior of the rocket to document the launch. These cameras are encoded and recorded. The onboard video system will stream two video feeds that switch between the cameras to show the required views during the launch timeline. That video is sent to the ground as part of the rocket’s telemetry data stream. A specialized decoder, which has only DVI outputs, receives the video streams. But DVI needs to be converted to HD-SDI so the video can be distributed at the Launch Control Center monitoring the rocket’s performance at the Kennedy Space Center and to feed other centers through NASA’s internal video network. Enter Analog Way’s VIO 4K processors, which will convert DVI to HD-SDI and provide a video processing amplifier for each video stream. After the core stage boost phase is done and it separates from the rest of the rocket, the onboard recordings of each camera, from liftoff to separation, will be downlinked to the ground processing unit. The recordings will also be played after launch for image analysis teams. Video feeds are recorded in both 1080p30 and 720p60. During the launch, the 1080p cameras are used for the first part of the ascent phase. Then both channels switch to 720p60. The ground decoder takes several seconds to change formats, so those units are all equipped with four decoder channels so that the switch from 1080p to 720p doesn’t lose information. For distribution within NASA of both the live video feeds and the first playbacks, the VIO 4Ks will be set for 720p. Full camera recordings played back for the image analysis groups will be done in native format with the video processing capabilities of the VIO 4K used to enhance the imagery.